Solar battery backup systems are becoming more common. New technologies emerging from other regions of the world are allowing our MASE team to explore battery backup systems for solar installations. These battery backup systems allow the energy from solar generation systems to be stored for later use instead of sent back out on the electricity grid. Our MASE team is experienced in every solar energy life cycle phase, offering turnkey design, development, construction, maintenance and asset management of solar PV systems. Currently we design, build and maintain every type of solar PV system, providing sustainable solar solutions for retail, utility and community customers. 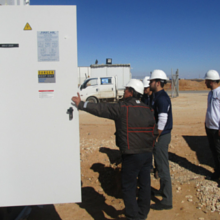 With a passion for advancing solar energy in Jordan and the Middle East, it makes sense our experienced team is exploring storage technologies. As the battery backup technology allows, we will offer these additions to existing solar installations, and engineer them into new systems for homes, businesses and utility scale solar.